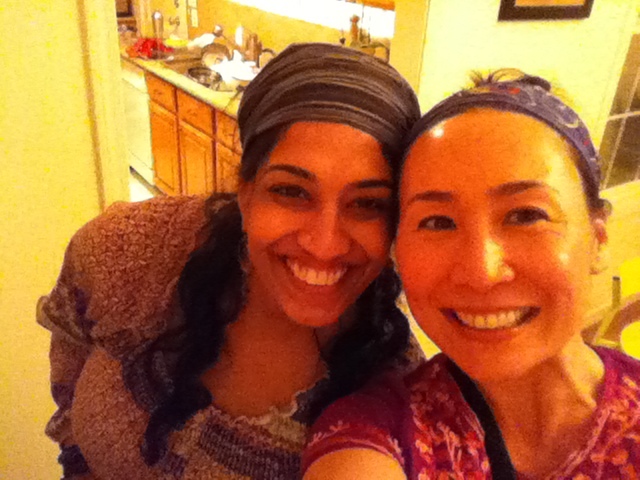 Eureka, Indian food! I decided I’d attempt samosas, but this would require some serious improvisation. Crab for all! Those are the potatoes way in the back. 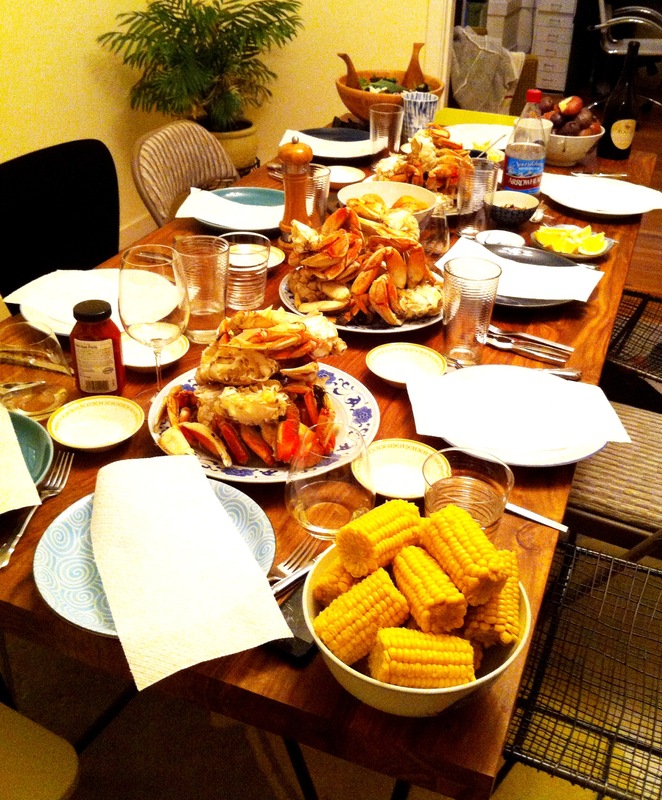 We also had garlic bread, corn on the cob, pecan salad and, of course, spicy boiled dungeness crab. I didn’t have any garam masala handy, so I made it. Peeled and toasted the cardamom pods that had been languishing on my spice rack for god knows how long and toasted the seeds on the stove top with a half stick of cinnamon, some whole cloves and black pepper corns. Then I dumped these in my “spices-only” coffee grinder and gave them a good whir. I cheated for the final ingredients, adding store-bought ground coriander seed and ground cumin to the mix. I could have made the flaky pastry dough required, but this seemed a lot of effort for experimental, reconstituted leftovers. I opted for store-bought spring roll wrappers instead. The only problem — they were square, and I needed round. Placed a bowl upside down over a stack of skins, traced it with a knife, removed the edges and cut the results into imperfect semi-circles. Tada! 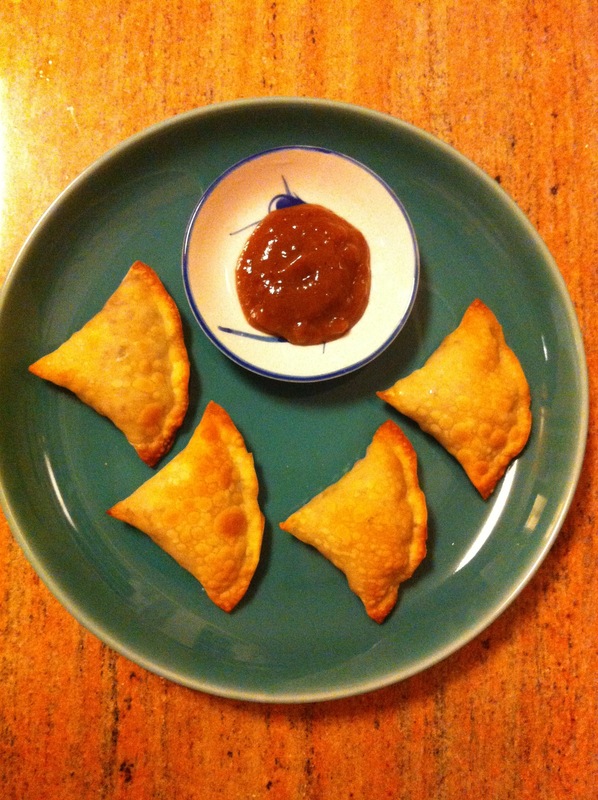 This entry was posted in Food and tagged Andrea Nguyen, Asian Dumpling Cookbook, healthy, Indian food, leftover, Omnivore Books, potatoes, Samosas, spring roll skins.